Why Hire a Professional Chandelier Cleaner in Pittsburgh? You’ve always treasured the beautiful heirloom that hangs brilliantly in your foyer or the dazzling crystal that glistens in your master bathroom…stunning accessories that add glamour to your home. But recently, you’ve noticed the glamour has been replaced by an inch of dust and grime over the past year or maybe even several years. For many, the idea of cleaning such an expensive and intricate centerpiece can seem like a daunting task. With a the help of Executive Chandelier Services, LLC, a professional chandelier cleaning service in the Pittsburgh area, your chandeliers will once again shine brilliantly. Attention to Detail – A professional cleaner will take the time to delicately remove, hand wash and rinse every crystal prism and strand. They will dry each piece with a soft microfiber towel and use white cotton gloves or finger cots to carefully replace each item to its original location. A gentle wipe of the chandelier’s frame, arms, light bulbs and any other non-crystal parts is also included. From start to finish, extreme care is always exercised. Preservation of Your Investment – Due to the meticulousness exercised by a professional cleaner, you can enjoy your investment for many years to come. Damage to your chandelier caused by pieces falling or improper cleaning methods is minimized when you hire reliable, experienced cleaners. Resources – Professionals are equipped with the tools and resources needed to complete the job. Whether it is special ladders or hydraulic lifts to reach a tricky spot or a piece of crystal that needs replaced, they are able to easily access items and tools needed. Expertise – Chandeliers not only come in a variety of sizes and shapes, but may date back a couple hundred years. An experienced chandelier cleaner has the knowledge and is familiar with handling the wide spectrum of crystal heirlooms and centerpieces. In addition, many cleaning services offer additional services such as repair, installation and restoration – an expertise many do-it-yourselfers may not have. Safety – Lastly, safety is always a priority. Hanging over a spiral staircase trying to remove your grandmother’s 200- year-old chandelier from a 30-ft ceiling may not be the best project to try on your own. Hiring a professional with the proper equipment and tools is highly recommended. Paying for a professional chandelier cleaning services has its advantages. If you want to ensure you are protecting your investment, schedule a professional service at least once a year. Executive Chandelier’s premier chandelier cleaning service brings more than 20 years of experience in cleaning, installing and restoring all types of lighting in the Pittsburgh area. Reliable and highly skilled, no job is too big or small. For a free estimate, call 412-487-9219. The quality of work is exceptional — and the results are extraordinary. This entry was posted in Chandelier Cleaning. Bookmark the permalink. 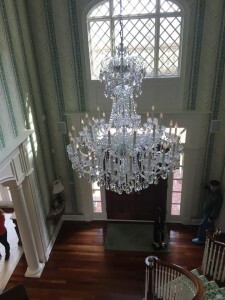 While there are other companies that will clean your windows throughout your home, Executive Chandelier Services LLC specializes in the delicate work required to properly clean your chandelier. From start to finish, using our cleaning process, we exercise extreme care. We begin by laying out heavy, padded blankets under your chandelier and surrounding area. Throughout the process, we take painstaking care of your home or business, to ensure the only evidence we leave behind is a sparkling chandelier. The result? The brilliance of your entire room will be restored. Your chandelier will once again became the eye-catching centerpiece it was always meant to be. At Executive Chandelier Services LLC, cleaning is just part of the premier services we provide. Our knowledgeable staff will also install your chandelier or other interior or exterior lighting. At every stage of installation, we apply the same care and precision we bring to our cleaning and restoration services. You can rest assured that your lighting fixtures will be installed properly and safely, and the results will be beautiful. Whether it’s a newly purchased antique or treasured heirloom, your chandelier might need a little love to bring it back to the radiance it had when it was new. Executive Chandelier Services LLC will bring all the experience and skill needed to restore your fixture to its former glory. With the same patience, care and precision we apply to our other services, we will meticulously examine your fixture. We will replace whatever is missing and fix whatever is bent or broken — selecting the perfect replacement from our extensive collection of crystals and other pieces. As with our cleaning and installation services, the quality of our work is exceptional — and the results will be extraordinary. Copyright © 2016 Executive Chandelier Services, LLC. All rights reserved.